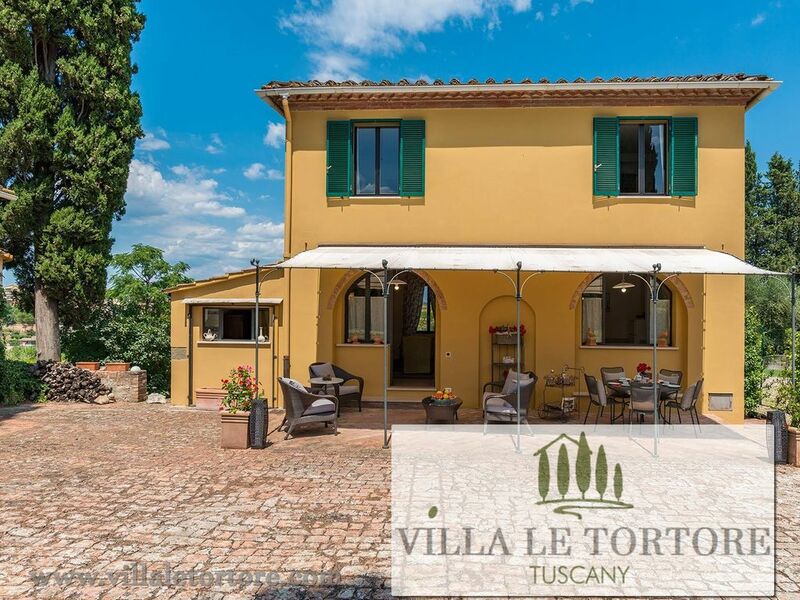 We had a lovely stay at Villa Le Tortore beginning of March 2019. We arrived late in the afternoon and were nicely surprised by the food and drink gifts. The house has everything to spend holidays like we did with our family of two children. The entrance to the estate was impressive, but the view from the bath room to the hill of Siena was really amazing. We walked uphill to the town of Siena in just 10 minutes. We also visited nearby medieval towns like Volterra, San Gimignano, Pienza and Montepulciano and drove by car in the wonderful nature of Crete Senesi. We would definitely like to come back during summertime to use the swimming pool and enjoy the view to the other side. We highly recommend the place for people who like a clean and well equipped house located in the centre of Toscany. Many thanks and see you soon! We spent 9 nights at the Vill La Totrore. Our host greeted us and spent time giving us directions and advice. It was clean and quiet (there was some construction going on, but we were gone most days and it was not loud power tools or anything). Walk down the drive and 1 short block to the small grocery store, or continue uphill to Siena. We were lucky enough to arrive just before a special Palio, which made the stay special. We say some of the olive harvest on the property. Sadly, the pool was also undergoing repairs, but only one day was warm enough to tempt us anyway. I highly recommend the villa. A great price and a relaxing home away from home. Thanks for the description and compliments, we are proud when our guests spend a nice holiday and appreciate what we offer with our property. We hope to always meet the needs of all, we work for this. Thanks and see you soon. My friends and I loved our stay at Villa "Le Tortore" during our visit to Siena in Tuscany. When your arrive at the villa there is a gate and a driveway that is lined with cypress trees. The property is gorgeous, clean and well maintained. The pictures of the property are just as they are listed online. We were greeted by the owner, Andrea, upon our arrival who gave us a tour of the house and garden (Andrea, "Thank You" for the tomatoes from your garden). We were surprised and delighted to see the delicious spread of food (cheese, dry salami, fruit, bread, olive oil and wine) that was presented to us in the kitchen! I enjoyed waking up to the gorgeous views from the windows throughout the villa! The location was perfect for day trips to surrounding beautiful towns by car or a 15 min. walk to Siena, bus station and a small supermarket. I would definitely recommend this property and would stay here again! We are very pleased to be able to give our guests a fabulous vacation. We appreciate your kind review, we put maximum effort and a lot of passion. Thank you so much for how you leave the house. Hope to see you soon. Thank you. Loved our accomodation, the wineries and scenery! We were greeted by Thiago upon our arrival. He was very personable and gave us an overview of the property inside and outside and presented us with a goodie basket which included delicious fresh fruit, vegetables, walnuts, olives, a baguette, cheese and beverages. This was a welcome treat after our day of driving. We were provided with his cell phone number in case we had questions or had any needs that may arise. They provided a notebook at the property that included everything from using the appliances to restaurant recommendations which was used and appreciated. The large private pool was a special treat. We thoroughly enjoyed our stay at Villa Le Tortore. The property was clean and well maintained. Everything was as advertised and depicted online. We would definitely recommend this property. We loved Siena and the surrounding areas, absolutely picturesque. We would love to come back someday and if we do we will definitely stay here again! We had a wonderful two week stay at the this lovely property in a beautiful setting, very close to the centre of Siena (20 mins walk). The pool was lovely and we also enjoyed playing tennis. The house is beautifully furnished and the kitchen very well equipped. The lovely owners have really thought of everything to make our stay enjoyable. We were greeted with a selection of meat and cheeses and a bottle of wine - a very nice touch. One night we were left a basket of home grown tomatoes. I was impressed that there was plenty of linen including towels for the house and for swimming. It was so easy to walk into the centre and the short uphill bit made us deserve the delicious food on offer in Siena and gave us some exercise (along with the tennis and swimming). There is plenty to do in the centre - and wonderful to be able to stay late or go in early before the day trippers arrive. It's easy to visit places further afield such as San Gimignano or Florence as well as driving through the lovely countryside of Chianti and finding a Castello to visit before coming across a bustling town to eat gelati whilst surveying yet another view of the Tuscan scenery. We are very pleased to be able to give our guests a fabulous vacation. We appreciate your kind review, we put maximum effort and a lot of passion. Thank you so much (again) for how you leave the house. Hope to see you soon. Thank you. We had a great stay at 'Le Tortore'. The property is fantastic - a really well-equipped house, beautifully presented and furnished, with the luxury of air-conditioning in the bedrooms which was really welcome. A lovely sitting-out area too (so nice in the morning and evening), a garden for our use, an absolutely gorgeous pool, tennis court if you want it, and stunning views over Siena in one direction and across the Tuscan countryside in the other. Such an easy walk down the drive and up through the Porta Romana into Siena itself - we thoroughly enjoyed getting out early, exploring Siena in the relative cool of the morning, walking back to the house for lunch, relaxing in the house and pool in the heat, and then back into Siena in the evening to enjoy one of the many lovely places to eat. The Campo at night is fun and lively - so you get to enjoy Siena at the best times of day and night, yet escape to tranquil 'Le Tortore' whenever you want. For us it was a perfect and very special and unusual combination of exploring a beautiful city and enjoying the space, peace and tranquillity of 'Le Tortore'. Thank you so much Andrea for all your help throughout our stay - you were such a good host and it was much appreciated. Riscaldamento (a consumo con prezzi in vigore al momento del soggiorno), Tassa di soggiorno 2 euro a persona per notte (contante).